Peter and Cindy make brilliant partners on the stage and aim to make the magic they inspire in their audience spill over into everything they do. 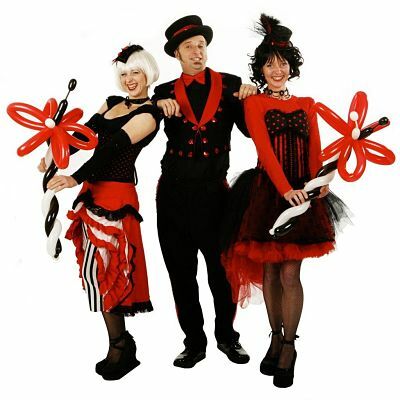 They have been performing professionally for four years and during that time have built up a great repertoire of entertainment pieces, many of which are original and unique to their dynamic duo. 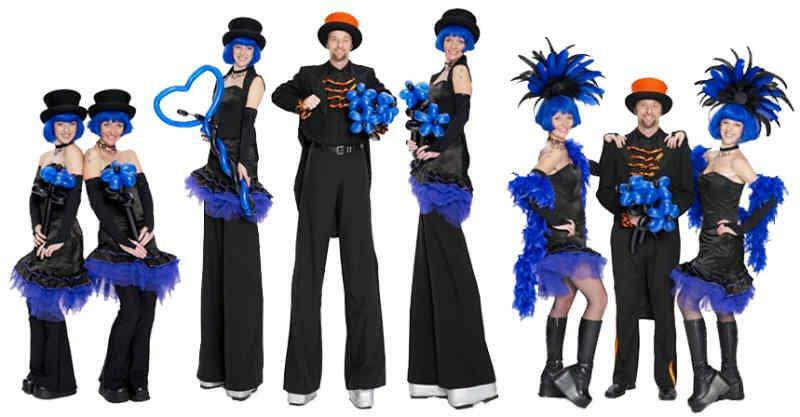 They are available together and individually for events and occasions all over the world. They are equity members with full public liability. 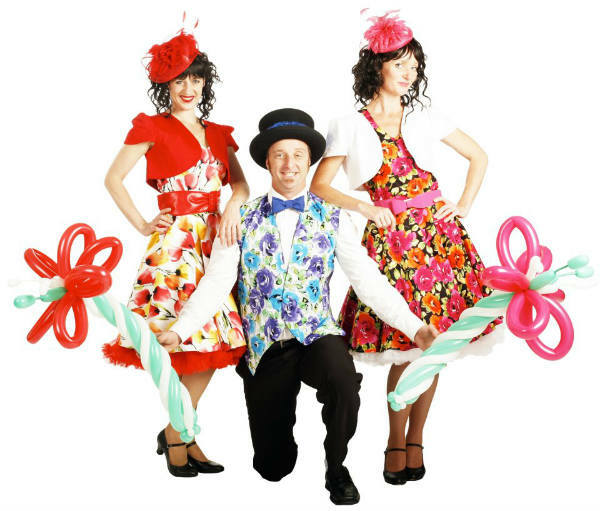 Cindy is an experienced seamstress and hence one of their main strengths is their wide range of quality costumes. Another is the fact that they have such a wide variety of skills, and this makes them ideal as a single, simple source for all your entertainment needs. 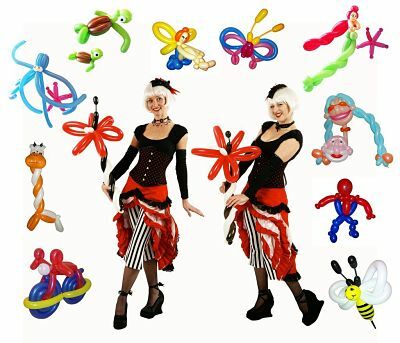 They specialise in impressively eye catching hats, amusing toys, caricatures & fantastic balloon costumes made to measure. 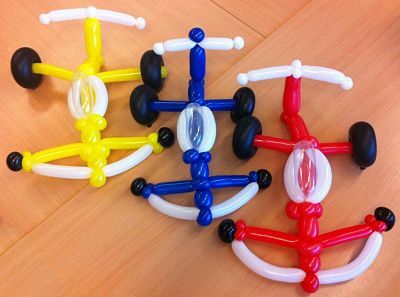 And for more interactive skill learning they offer balloon modelling workshops for all ages too! 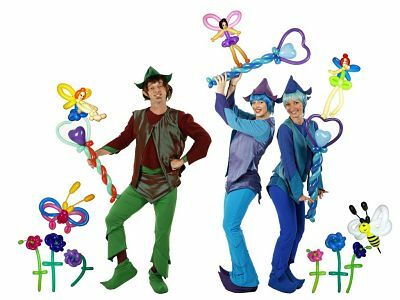 They have a variety of exquisite costumes ranging from playful pixies and sparkly fairies, to colourful and smart attire, and are always adding to their costuming wardrobe, so please enquire if you have anything specific in mind. 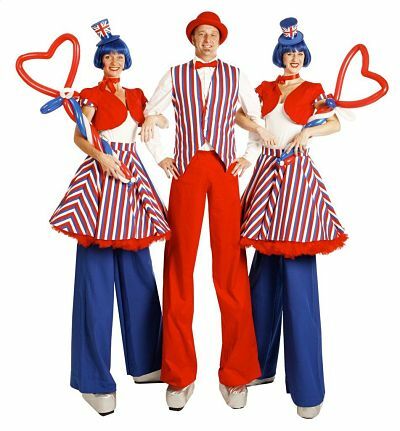 They stand heads above the rest, offering stilt walking characters too, for that extra visual feast and delight! Christmas Where would Santa be without his helpers and Peter & Cindy know where two of these little cheeky chappies hide. 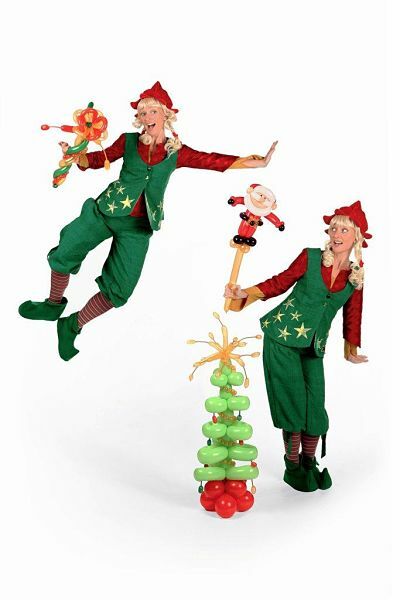 Available on stilts or on foot. 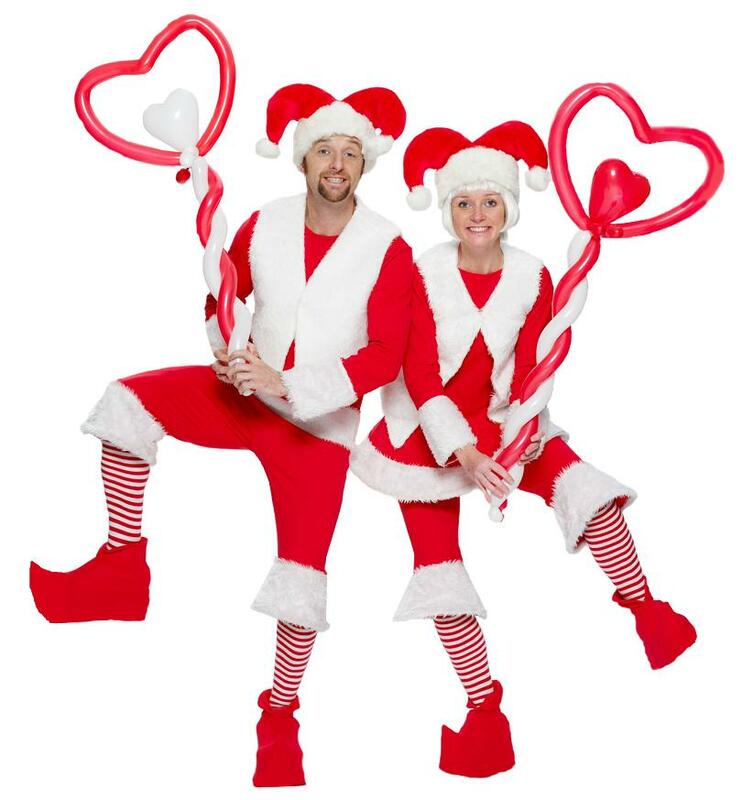 Great for parades, grotto queues meet and greet mix ‘n’ mingle. Heavenly Angels These beautiful dazzling white heavenly angels are a sight to see. Both sporting immaculate halos and huge wings, they shimmer and glide with grace bringing elegance to all occasions. Only available on stilts. 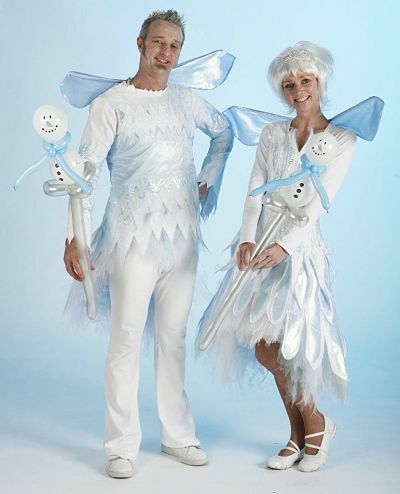 Ice Pixie & Frosty Fairy Blue Ice Pixie and Frosty Fairy are available on stilts and foot for all your Christmas celebrations. 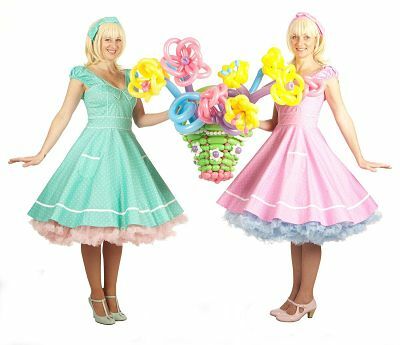 Blossom Two ladies costumes (one tulip design and one rose design). Two men’s costumes (one tulip design and one rose design). 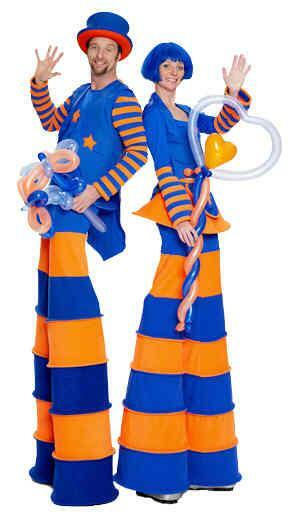 Available as ground or stilt costumes. 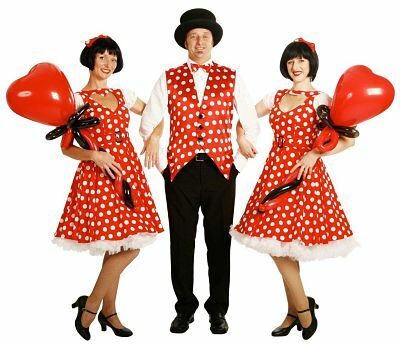 Dotties Two ladies costumes and one men’s costume available as ground or stilt costumes. 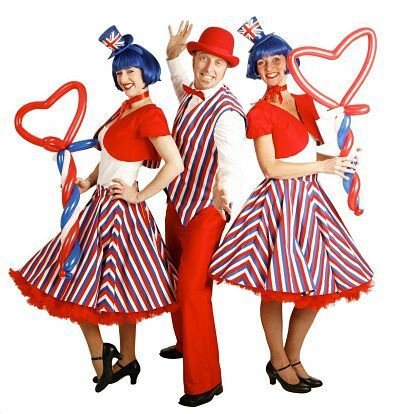 Union Jack & Jane (can be nautical or hostesses) Two ladies costumes and two men’s costumes available as ground or stilts costumes. The event went really well. Thank you. The staff you provided were all fantastic! 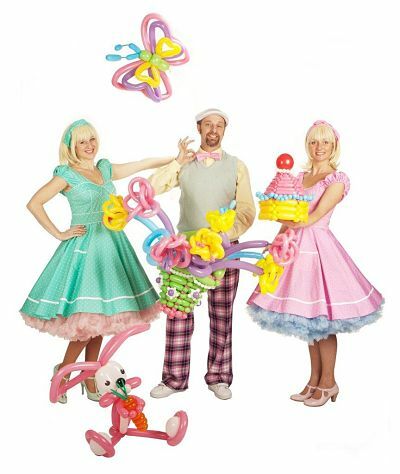 I was able to meet the balloon modellers and they were absolutely perfect for this event. All the guys were so professional, brilliant with the children and provided great entertainment. Cindy did a really good job balloon modelling and always had a massive queue! Cindy was perfect, professional, on time and as far as I’m concerned already has another booking with us for family day! Thanks for coming back to us for feedback. The day went really well and everyone here seemed to thoroughly enjoy it! I thought Cindy was great, she kept me informed on her eta by text and also texted me afterwards to say thanks for hosting her. She was professional, self-sufficient and loads of fun! The kids really seemed to like her and her balloon modelling is fantastic (my daughter can vouch for that as she loves her fairy!!) She spent time preparing cars and Santas to hand out and was really keen to make sure the balloons were the best for the audience. I also really liked her outfit – caused quite the stir! Highly recommended!